Within the Ecology Center, there is a section dedicated to films that are available to loan out – a mini-library. As long as you are a current member, you may borrow the movies you want to watch for two weeks, with a five at a time limit. I have perused the shelves plenty of times and spotted lots of movies that I want to see, but have never taken the time to borrow any of them. But since it’s summer, I thought it would be the perfect time to watch a couple of movies and check them off my must-see list, and even better, why not write a blog about it? This is my list of movies and documentary picks. Baraka and Samsara are two parts in a beautiful portrayal of human life and nature. These two documentaries showcase many different parts of the world, ranging from urban landscape, to Indonesian sulfur mines, to Epupa Falls in Angola. Ron Fricke represents these varied cultures through cinema verité. There is no narration and each scene is accompanied with instrumental music that perfectly matches up to the shot changes or to what is happening within the scene. This based-on-a-true-story film depicts the huge legal battle involving one of Pacific Gas and Electric’s plants which was nestled right next to the small town of Hinkley, California. An astonishing number of residents there were diagnosed with cancer or other diseases. Further investigation revealed that PG&E had been dumping carcinogenic waste into the ground water that the townspeople were drinking and bathing in. The protagonist is Erin Brockovich, a single mom of three who struggles to provide for her children. She begins working for a legal firm and becomes instrumental in this case. Despite the movie being dramatized for Hollywood purposes, it was heartening to learn about a nonconforming, successful woman. Miyazaki portrays a battle to preserve a sacred forest against toxic mining companies in this well known animated film. Humans are at war against the forest animals, and between them all is an exiled prince in search of ultimate peace. I saw this movie as a child and recently rewatched it-, and both times I loved the fantastical element used to raise the issue of deforestation as a result of human advances. The moral of the story was easy to follow, but it was more difficult to follow the actual storyline. Although that might just be me, and I still consider it to be a great movie. This movie described the United Farm Workers’ struggle for improved working conditions in California through the use of reenactment, old footage and photographs, and interviews with some of the strikers. It focuses on Cesar Chavez’s role in the Delano grape strikes and boycotts. It was an enjoyable film to watch; before I only knew basic details about this historic strike, and this film filled in my knowledge with a clear chronological order. It was especially interesting to be reminded that farm workers were not only Mexicans/Mexican Americans but also Chinese, African Americans, Japanese, and Filipinos. This documentary analyzes different cities’ urban planning and projects that have improved the daily lives of all citizens. For example, Bogota, Colombia utilizes a high-tech bus system that resembles a subway system. They have their own lanes on freeways, and the bus stops are mini-terminals. This system has encouraged commuters to take the bus, which both frees up traffic and creates less pollution. This movie served as a great introduction to a subject I haven’t researched very much. This documentary analyzes the 9/11 attack as well as the events preceding and following. Moore does a great job of investigating and piecing together what he believes was a conspiracy produced by the union of the Bush family and the Bin Laden family. For someone who was only three years old when these events occurred, the film was helpful in explaining the chain of events. However, at times it was hard to follow because I didn’t know much about the history or important people from that time. I definitely think a second viewing would be useful to increase my understanding of the topic. Up The Yangtze– Yung Chang As a child, Yung Chang was told stories about the Yangtze river by his grandfather who lived in China. They tell a very different story than current reality. The Yangtze river is now home to the Three Gorges dam, the largest hydro-electric dam in the world. As a result, water levels are rising and pushing out low-income families who live next to the river and rely on its fertile banks to make a living. Chinese businesses have capitalized on the situation and created cruises for tourists to commemorate the vanishing land. The documentary follows two cruiseship employees: a young middle school aged girl from a poor family, and a middle class young adult male. Although the documentary was interesting to watch, it was very one-sided, and I wanted to know more about the country’s motives and reasoning behind creating the dam. 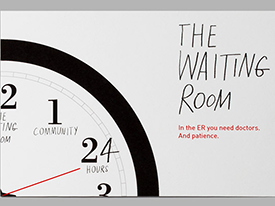 The Waiting Room– Peter Nicks This film documents a 24-hour sliver of the emergency room at Oakland’s public Highland Hospital. It is both tragic, humorous, and at rare times, encouraging. Nicks does not sugar coat anything which made the documentary more painful to watch, but also much more authentic. For those who don’t know much about Oakland, it is an interesting way of getting a snapshot of the culture. It is difficult to face what lack of healthcare really looks like. With this film, we see very valid examples of how real people got into these situations. The Garden– Scott Hamilton Kennedy After the LA riots of 1992, residents of South Central LA came together to create a community garden on an empty plot of land. Years of cultivating various fruits and vegetables went by without opposition from the landlord or the city. However certain city officials and corporations banded together to begin a scheme to remove the garden for their own profitable purposes. Kennedy follows the conflict in its entirety and expertly explains all different points of view. This is definitely an eye opening, worthwhile documentary to watch. This entry was posted in Blog and tagged Ecology Center library, Ecology Center Members, film screening, youth, youth development by Ecology Center. Bookmark the permalink.